Funeral food with a twist! We talk with Perre Colman Magness, the author of The Southern Sympathy Cookbook about her often hilarious book. Love Southern food? The recipes are to die for. Plus, Amy Bloom dishes about her new novel, White Houses, and helps describe 11 Minutes, a new rosé we’re wild about. Finally, Thomas Matthews, editor of Wine Spectator shares info about Mary Wade’s annual wine dinner. 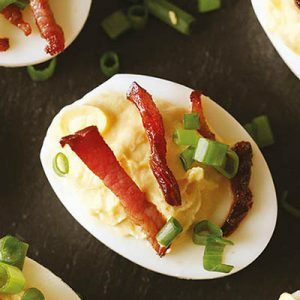 Photo: Buttermilk Bacon Stuffed Eggs © 2018 Perre Coleman Magness. Note: The 13th Annual Mary Wade Wine Dinner will be held at the Omni New Haven Hotel at Yale, on Saturday, April 21, from 6-10 pm. Donations from this year’s dinner will support renovation of the Boardman Historical Building, which houses the Residential Assisted Living Center. Go to MaryWade.org for tickets and information about the event.